As part of our oncology solution, we had to build mobile applications. All our services were built based on SOAP. For our web application SOAP/WS-* worked out very well. But, when it comes to mobile world, SOAP was too heavy. Performance on our iOS application was so bad with SOAP that we had to implement part of our server solution to support REST. At that time there was so much confusion on which Microsoft technology to be used to build RESTful services. Recently Microsoft released ASP.NET MVC 4.0 Beta (with go live license). If you are a Microsoft shop and want to build RESTful web APIs, look no further, just download MVC 4.0 beta and use it. This gives you all the infrastructure you had in the MVC world and world class support for building 100% HTTP compliant web APIs. Implement authentication and logging as cross cutting concerns (using delegating handler a.k.a message handlers in the HTTP pipeline). I will try to post some code snippets on these topics soon. 2. Fiddler (you can send GET/POST/PUT requests. If you have a secure/https server while testing, FIREFOX plugin did not work). Fiddler has much better XML/JSON viewing (of your responses). Reading a book on Startup. Some of the things mentioned in this book stood out and I completely agree with them. A startup is a highly passion driven and irrational endeavor. Without passion you cannot start a startup. You have to have overwhelming sense of desire to find a solution to problem or to transform a market. All big businesses start out as little businesses. The personal ambition of the people running the startup decides how big they get. On a different note, you cannot do it all by yourself. You need to find people who are as passionate as you are and whom you can trust. In my experience, this is the most challenging part. I am lucky with my current endeavor, I found a partner who has the same values as I do. We trust each other and both beleive in what we are trying to accomplish. We understand that we have lot of challenges infront of us, still keep moving forward every single day with the same intensity. “There are lot of driving factors (clinical and financial) which are forcing regimen Standardization”. 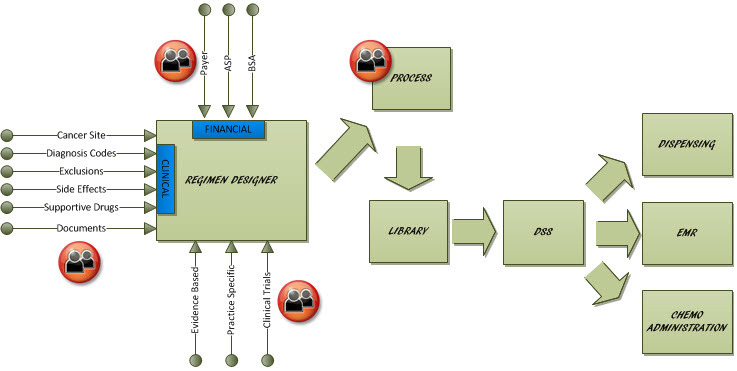 Modeling regimen’s clinical and financial aspects can be very challenging. The following picture captures some of those aspects. In addition to the ability to capture all this information easily, it is important to be able to use this information in dispensing and administration process. You can also use our regimen designer while talking to patient about the treatment costs.